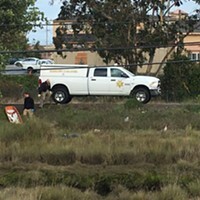 Animal Control responding to Ramone's. 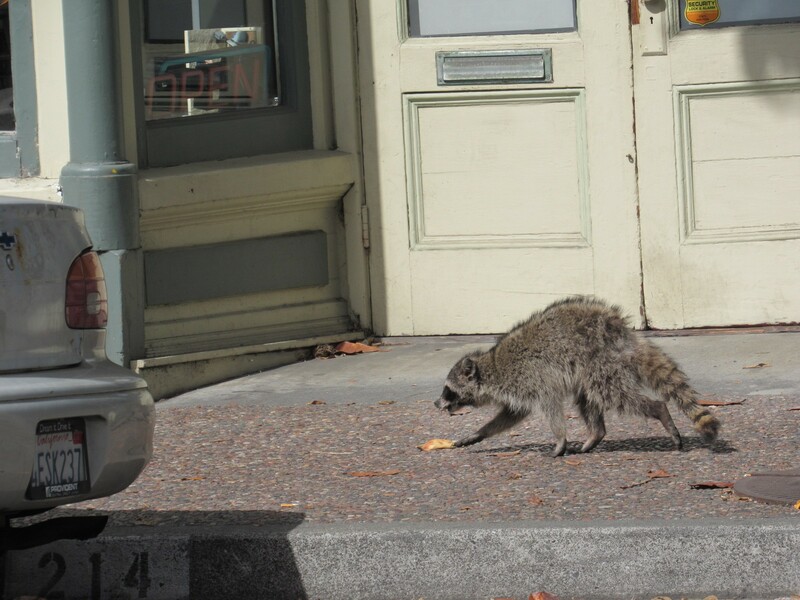 Eureka Police Department's Animal Control Officer, Rob Patton, escorted an unwanted guest from Ramone's in Old Town on Friday morning. The bushy-tailed varmint had been curled up beneath the pastry counter for an undetermined period of time, only to be noticed by a barista coming in for her mid-morning shift. 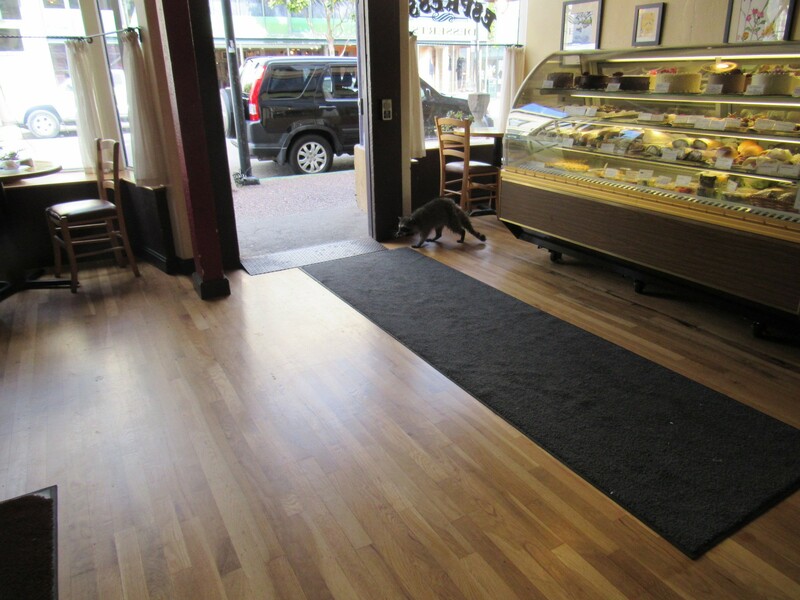 As customers and staff watched, Patton used a long pole to nudge the raccoon from its hiding place and out the door. An employee hastily stepped outside to warn customers away from the entrance. Raccoon skulks away from the pastries. 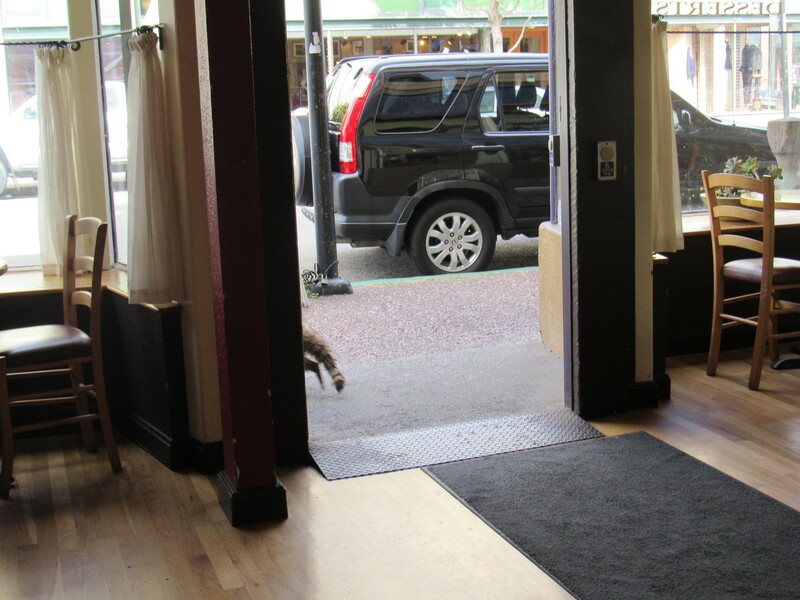 Raccoon disappears out the door. Patton followed the animal as it limped across the street and down Opera Alley. He said the raccoon was "old and sick" and probably just wanted a place to rest. "You can't blame him for coming in [Ramones], it smells so good in there," he said. Patton said that he would follow the animal until it found a place to hide and sleep, as most of them do during the day. Apparently Old Town has a large population of the critters, although they're rarely seen by daylight. Patricia Gair, owner of Old Town Hair Works, watched alongside Patton as the creature bedded down under a cabinet downstairs from her salon. She says she has a constant problem with the animals climbing onto her awning and unscrewing the tiny lightbulbs on her sign. "I guess they think they're berries or something," she said. 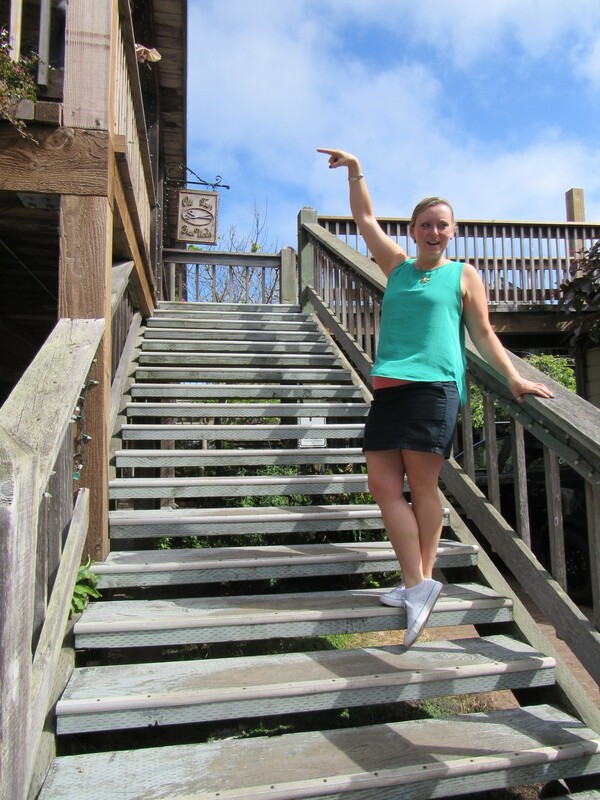 Salon owner Patricia Gair points to where raccoons routinely do mischief. 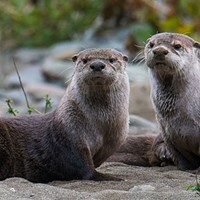 It's unlikely that the animal was rabid, said Patton, who says rabies in raccoons is "mostly an East Coast problem," although they can be cross-infected by dogs with distemper and other diseases. The top carriers of rabies in this region are bats, skunks and foxes, in that order. Raccoon on the prowl for a place to sleep. Patton added that his department will likely be re-submitting a proposal to the city council next year to sever its memorandum of understanding with the county shelter. 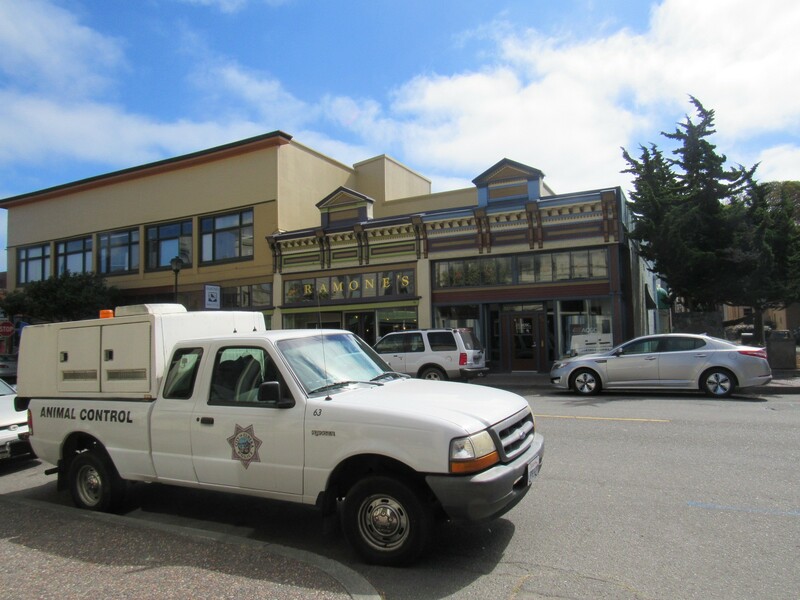 Pursuant this year's budget crisis, he and other staff on the Eureka Police Department had prepared to assume responsibility for the numerous stray dogs that Animal Control currently takes to McKinleyville for processing. This would have saved the city $130,000, but the council declined the idea, to the approval of animal rescue groups. According to Patton, about half of all stray dogs are picked up on the same day. The others would be put in kennels that Patton has already started collecting and then filtered out to private rescue organizations. Chief Andy Mills said in his address to the city council that "unadoptable dogs would be destroyed." As the raccoon settled down for a long afternoon nap, a crow scolding it from a nearby rooftop, Patton turned back to his truck. The majority of his calls, he told us, are for barking dogs or loose dogs, but there is the occasional more exotic emergency, such as the gentleman whose flock of assorted fowl annoyed his Summer Street neighbors. 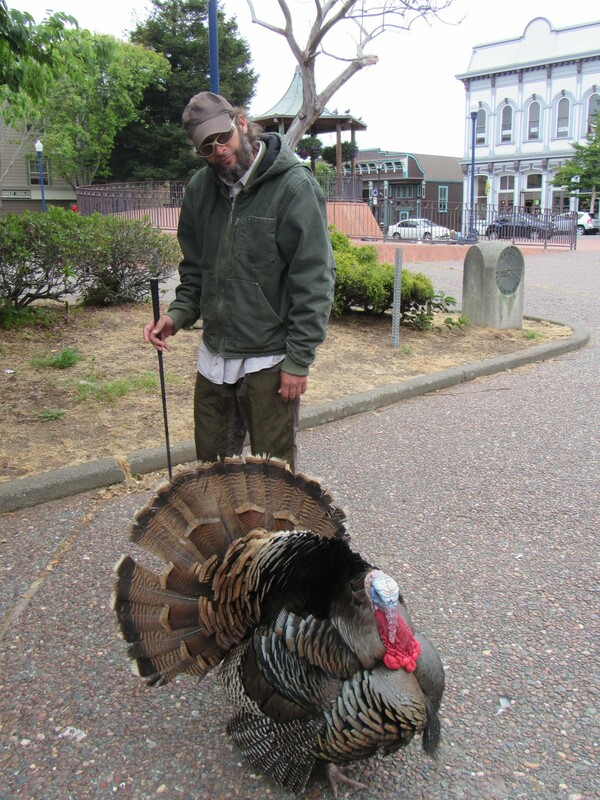 When told that the same man and his turkey had been promenading down Second Street the day prior, Patton gave a non-committal grunt. Just another day on the job for the man who guards us from all things that bark, chitter and gobble. Turkey-about-town Jack Lincoln strolling through Old Town.